I'm really into using praline (nuts and caramelised sugar) at the moment and it plays a part in one of our favourite desserts, a chocolate pecan praline tart. 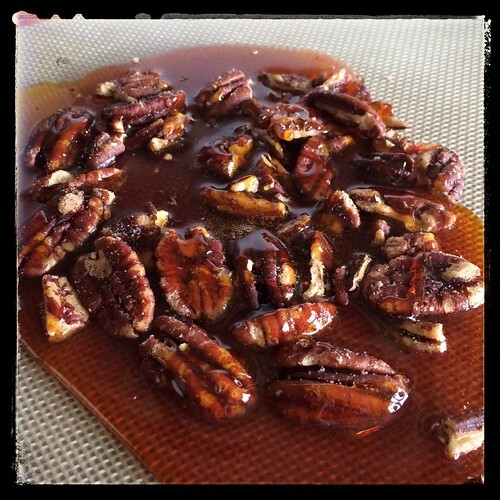 It is my re-vamp of a recipe that has been around for a while - I've changed the quantities to make it a more family-sized dessert and have used pecans instead of hazelnuts. Serve it with some clotted cream or the praline cream and this tart will be elevated to OMG levels. 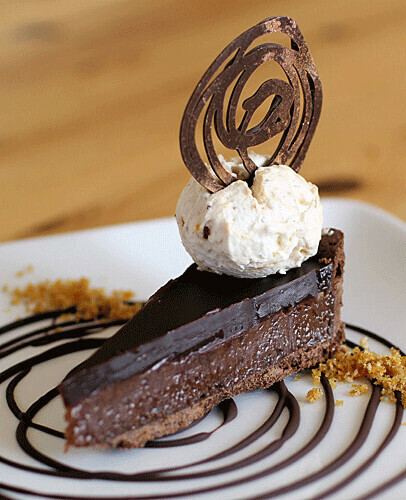 A chocolate tart case filled with a chocolate pecan praline filling, topped with dark ganache and served with praline cream. Heavily adapted from a Gourmet Traveller recipe. Notes: You need a loose bottomed tart tin that is approximately 23cm in diameter and 3.5cm deep. 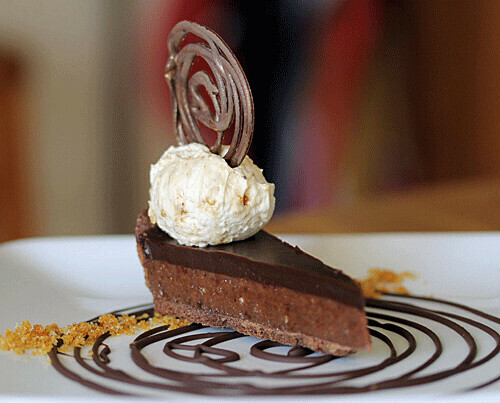 You must use double cream to prevent the filling and ganache from splitting. Instead of microwaving the chocolate, you can melt it in a bowl placed over a pan of simmering water. Warm a knife under hot water and dry it before slicing the tart, repeat before cutting each slice. Put the flour, cocoa powder, icing sugar, pinch of salt and the butter into a food processor and pulse until the mixture looks like fine breadcrumbs. Add the egg yolk and pulse until the mixture is combined, you may need to add a couple of teaspoons of cold water at this point to get it to bind. Turn the mixture out onto a floured surface and gently knead it together. Rest in cling film for at half an hour. Roll the pastry out to fit the tin (see note above) and prick the surface with a fork. Freeze the tart shell for an hour and then heat an oven to 200ºC. Brush a piece of foil with butter and lay it tightly onto the pastry. Bake for about 12 minutes. Remove the foil and bake for another 10-12 minutes, until crisp and dry. Leave to cool. Lay a Silpat or silicone sheet onto a baking tray and put the pecans onto it. Put the sugar into a small saucepan and heat over a medium heat until the sugar dissolves and turns a caramel colour. Pour the caramel over the pecans and leave to cool. When cold, grind the sugar and nuts in a food processor until you have fine crumbs. Reserve one-third of the praline crumbs for the praline cream. Put the chocolate and the double cream into a microwavable glass mixing bowl and place in the microwave. 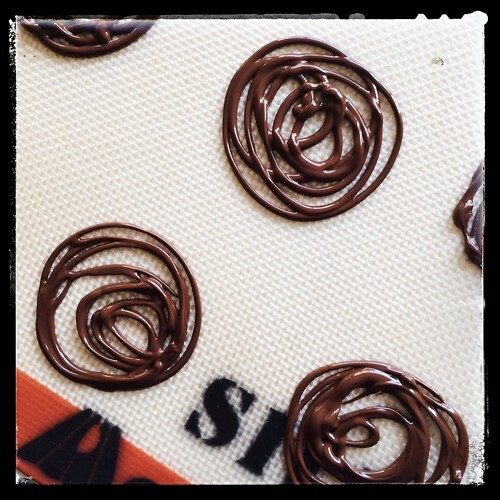 Heat for 30 second bursts on high and stir in-between until the chocolate has melted and combined with the cream. Add two-thirds of the praline crumbs and stir to combine. Pour into the tart shell and refrigerate until set. Put the chocolate and cream into a small microwavable glass bowl and microwave in 30 second bursts, stirring until the chocolate has melted and the mixture is smooth. Spread evenly over the tart and leave to set in the refrigerator. Whip the cream to soft peaks and fold in the reserved praline. Serve with slices of the tart. I love praline! Your recipe looks fab! Wow it looks so delicious and pretty! Pecan praline sounds like heaven too!